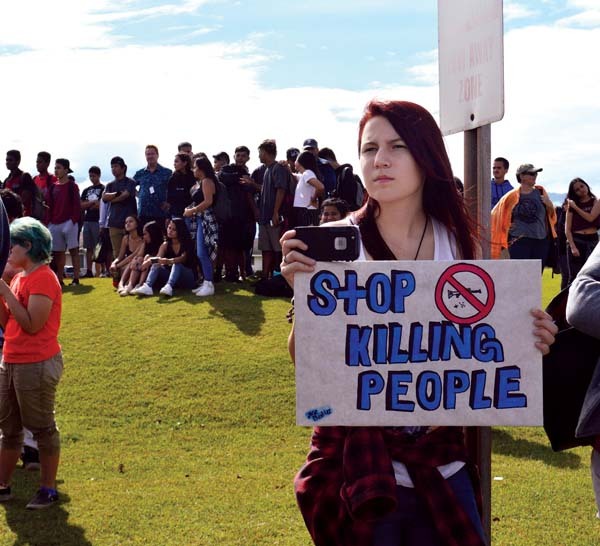 KAHULUI – About a thousand Maui High students walked out of class at Maui County’s largest high school on Wednesday, joining students across America in National Walkout Day to rally for changes in gun laws in remembrance of the 17 killed last month at a Florida high school. 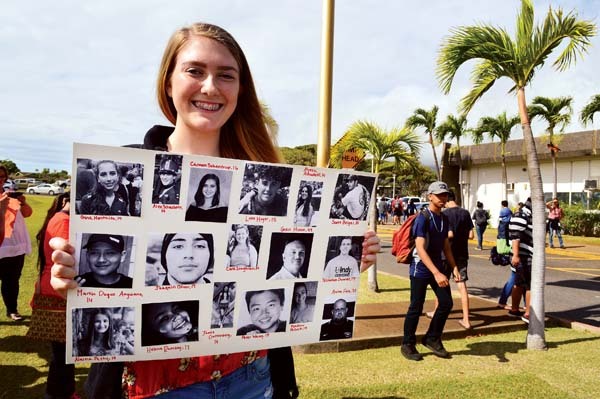 Sophomore Anna Bernstein of Kihei held a sign she made with photos, names and ages of those killed by gun violence at Marjory Stoneman Douglas High School in Parkland, Fla., on Feb. 14. 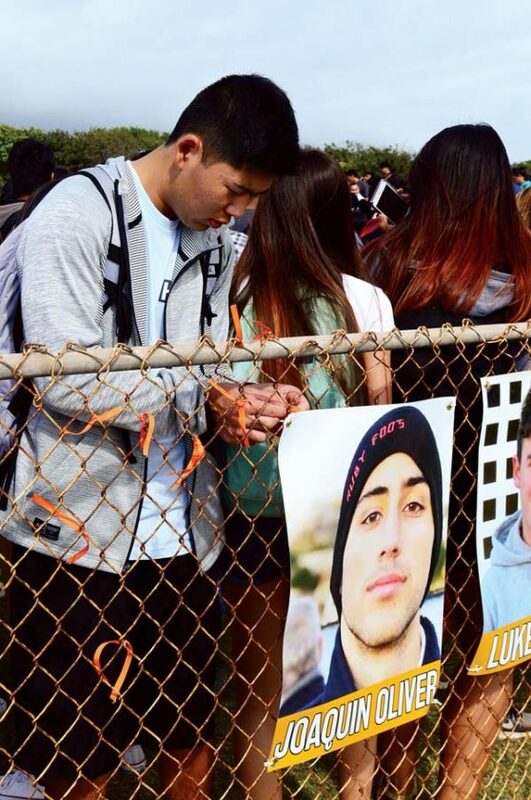 “I felt they deserved to be commemorated,” Anna said during the walkout after students tied orange ribbons on a school fence. Orange is the color for gun reform and protesting gun violence. Anna advocated for more awareness and discussion on gun violence but not for arming teachers. Students might steal the guns, for example, which could cause more problems, she explained. Public and private school students across the county held student-led walkouts. Most occurred around 10 a.m. and lasted 17 minutes — 1 minute for each of those who died in Florida. Prosecutors are seeking the death penalty for Nikolas Cruz, 19, who has admitted carrying out the attack. The former student at the school is charged with 17 counts of premeditated murder. University of Hawaii Maui College staff and students also joined the walkout. 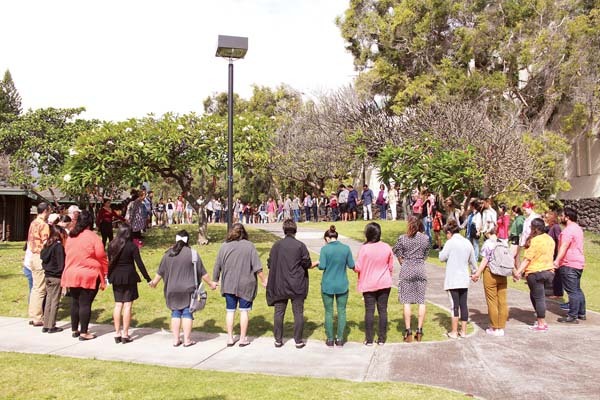 Library student assistants and staff tied 17 ribbons to a tree on the Kahului campus’s Great Lawn. At one point, participants formed a circle and held hands. Chancellor Lui Hokoana urged staff to refrain from punishing students for part-of-day absences for those participating in the walkout. Maui High rearranged its bell schedule to accommodate the walkout. 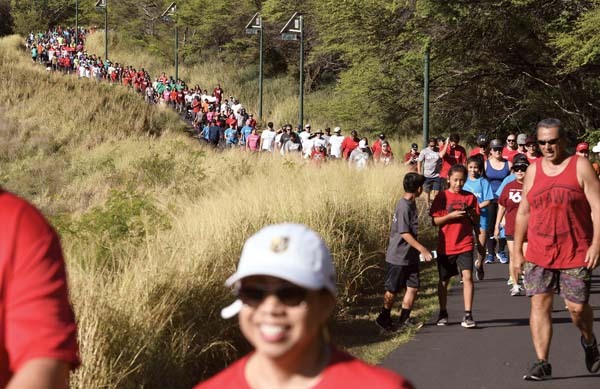 One of the student organizers, Caroline Short, a 16-year-old junior, estimated that at least half of Maui High’s student body of 1,900 students participated and she was surprised by the large turnout. During the 17 minutes, students signed a banner to be given to the Florida high school. Molokai High’s Facebook page indicated that students there also joined the walkout. A post called the event a “walk up” and encouraged students to join in. State Department of Education spokeswoman Lindsay Chambers said the event was student-led, so the department did not have a count of schools participating. She added that there were no reports of students being disruptive or leaving campus. 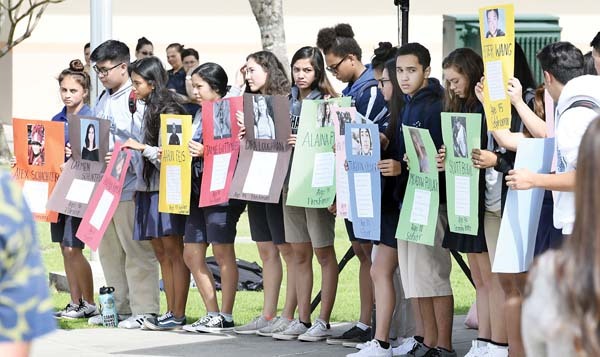 Earlier this month, Superintendent Christina Kishimoto sent out a letter advising schools to create designated walkout areas on campus and to encourage students to use the time to share ideas for improving campus safety, security and culture. It said the Education Department supports students’ constitutional rights to a peaceful assembly and free expression. 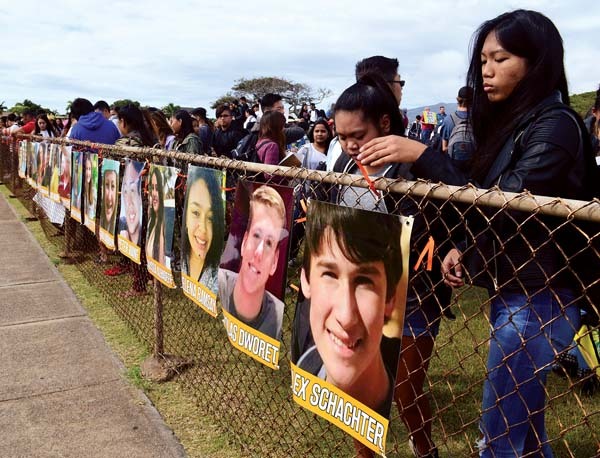 At the high school campus of Kamehameha Schools Maui, most students who walked out gathered near the flagpoles outside the high school office at 10 a.m.
Seventeen Kamehameha students held posters with the fallen students’ and staff members’ names and photos. One by one, they read the names aloud. 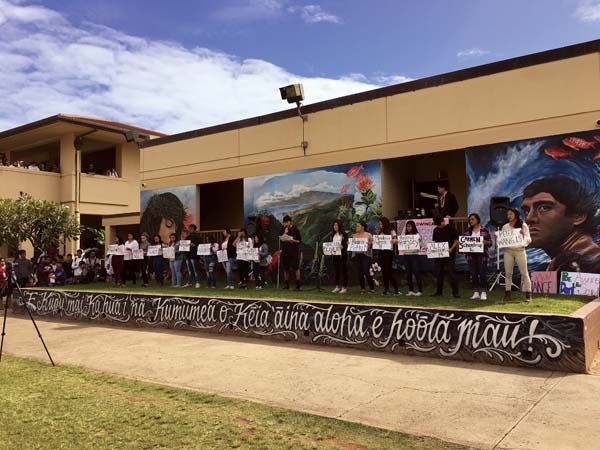 Along with a message and prayer from kahu Kalani Wong, three students performed a hula to honor the fallen.One of the students holding a poster, freshman Breeana Anguay, 15, said she wanted to show her “love and support” for the victims and their friends and families. “They are not alone,” Breeana said. “We may be far away, but we stand together as one nation.”At Baldwin High, 500 to 600 students participated in the walkout, said organizer Lily Katz, a senior. “It was amazing; it went really well,” she said after the event, adding that she wanted to cry when seeing students assemble. The students gathered in the “quad” in the central grassy area of the Wailuku campus. Senior Jade Peters read a poem, and Lily spoke about the importance of voter registration and carrying the momentum for change forward. Students also held signs with the victims’ names and ages while a short biography was read for each victim. Lily said students were absolutely silent as the biographies were read. Kihei resident and performer Anthony Pfluke, 17, also made an appearance at Baldwin during the event. Anthony was part of a Maui contingent that took a 3-mile-long lei to Marjory Stoneman Douglas High School to show Hawaii’s aloha there. It was part of the Lei of Aloha for World Peace project. Another of project’s leaders, Hawaiian cultural practitioner Kimokeo Kapahulehua, was at Maui High during the walkout, recording the events on his cellphone. Kaelina Escobar, 16, another of the student organizers at Maui High, expressed sadness over the mass shooting and deaths. She moved from Sacramento, Calif., to Maui two years ago and said she lived in greater fear on the Mainland. Just last week, her old high school was placed in lockdown after a shooting threat. While gun laws are stricter in Hawaii and Maui High generally feels safer, Kaelina noted the “big and open” Kahului campus. “Anything can happen,” she said. Maui High sophomore Jordan Vaughn raised her hand when a student speaker asked if anyone in the crowd had held a gun before. She said she fired a gun in Texas while target shooting with family. The 16-year-old said she doesn’t like guns and believes there should be stricter laws on ownership and for those with mental illness and limits on the number of guns a person can own. 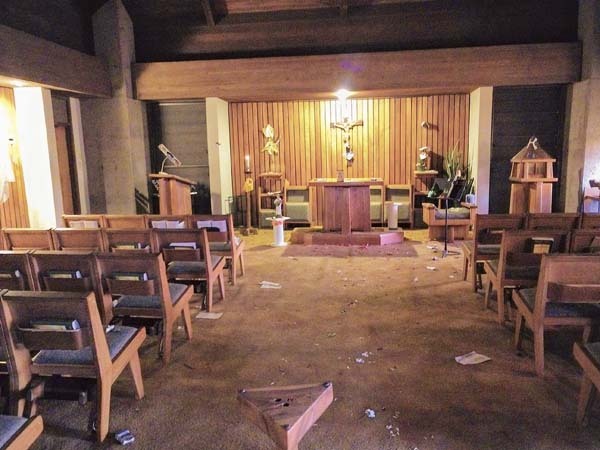 * Staff Writer Matthew Thayer contributed to this report. Melissa Tanji can be reached at mtanji@mauinews.com. Shum runs down a return.